I couldn’t argue with that. I suppose I could have could have given him any of those answers. On a bad day, I might have done just that. Happily, I chose a better option that day. Have a COURAGEOUS and CURIOUS New Years. I don’t believe that at all. Strong faith is faith that is challenged and questioned. God seems to appreciate a good question, and doesn’t appear to mind even a bad question. Questions provide opportunity for growth in a way that acts of piety may not. Questioning the wisdom of experts is needed for change and insight. Even when the experts are correct, the correctness cannot truly be appreciated unless it is first challenged. Christian missions and the Christian life is not simply memorizing a catechism and following some set procedures. It is growing in relationship with a living God, living with a community of faith, and interacting with a broader society. Questions help us grow in these relationships in a healthy way. So I wish for you to be curious. I hope that will lead you to ask questions. Be courageous enough to ask the questions that people will try to stop you from asking… those are often the best questions. And I hope you will show mercy for those with questions. Peter in I Peter 3:15 and 16 gives good advice to give good answers with the right attitude. Squelching questions does not accomplish this. #10 Fallacies and Questions Surrounding Redemptive Analogy. Redemptive analogies (along with metaphors, stories, parables) can be effective in communicating God’s truths. However, there are some areas of confusion with redemptive analogy, and this post tries to address some of these. #9 What View Should the Christian Take of Non-Christian Religions. This posts points out three common views about non-Christian religions (come from God, come from Satan, come from Man) and utilizes the example of the Longhouse religion prophet Handsome Lake to illustrate the complexity of the issue. #8 Some Thoughts on Culture and Communication: Part III. I never did figure out why this one was so popular while parts I and II have been somewhat ignored. Search engines are funny. However, part III is the integration of some semiotic theory and the three-culture model to suggest how contextualization must primarily act on the symbolic level rather than material or institutional levels. #7 Screaming Hornets and Letters from Home. A more personal post, pointing out how important it is for overseas or cross-cultural missionaries to receive personal notes, and other remembrances from back home. #6 Christian Missions: Destroyer of Cultures? Looks into the charge that Christian missionaries destroy cultures. The post gives a qualified NO, but does recognize that missions does affect culture, and has at times hurt local cultures. #5 Missions and the Resurrection of Christ, Part I. Part of a longer discussion, but shows that the resurrection of Christ is key to the recognition of His character, His message, and God’s word. As such, it is foundational to Christian missions. #3 Missions Starts at Home. A look at the Shema (from Deuteronomy 6) and the ways it shows we should educate our children in the home. #2 From Power Encounter to Love Encounter. Looks at the three major popularized encounters: Truth, Allegiance, and Power Encounters, and suggests that Love Encounter is a valid encounter and should replace Power Encounter as one of the big three. #1 Missions Starts at Home: Part II. Post talks about some things we did to prepare our children for being in the mission field. Focusing more on personal experience than on the words of experts. Here is a presentation I did a couple of years ago that looks at a lot of different issues in Christian Missions today. It is part of a 3-hour presentation, so each topic is handled pretty briefly. However, hopefully it still gives some food for thought. 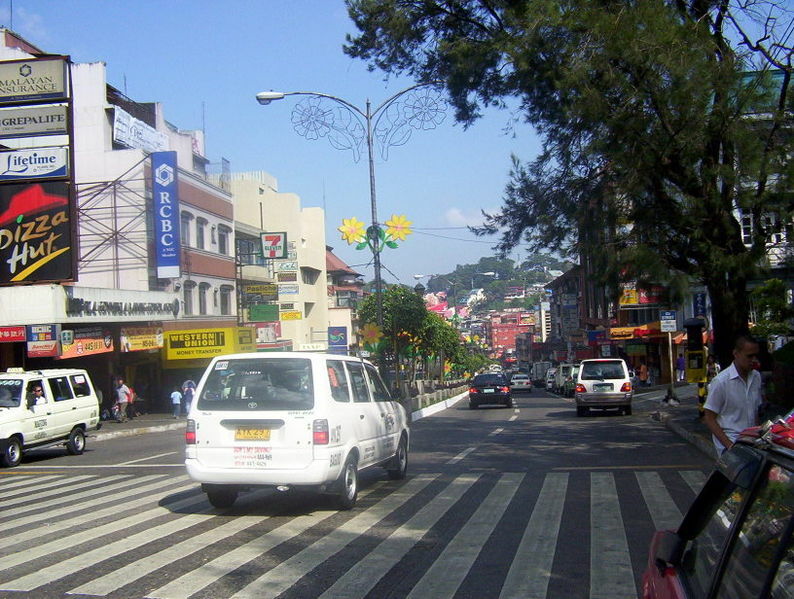 Yesterday we were walking down Session Road, the “Main Street” of Baguio City. There were the normal crowds of walkers, strollers, and peddlers. It is kind of nice to find a bustling downtown when so many downtowns in the US have been destroyed by the automobile, suburban sprawl, and big box stores. Going further we periodically see beggars. Most are old, sitting barefoot or hunched over, head and eyes cast downward with a thin arm out with a disposable plastic cup in hand to receive coins. Others are handing out flyers for different things… commonly to buy a house or condominium, go to a certain restaurant, or to convert one to their religion. It is a lively place to be. As we were walking down towards Burnham Park we started hearing yelling. At the top of some steps was a man holding up a large Bible. Behind him in a semi-circle were others dressed similarly holding up signs and Bibles. It was classic street preaching/evangelizing. They were wearing red shirts with a verse from the book of Romans on it. There were perhaps 15-20 people idly watching and others, like us, passing by with modest curiosity. We continued walking, but it gave me something to think about. 2. Is this evangelism? Evangelism is presentation of the good news of Christ in a way that can be understood and appreciated. Now suppose we accept this definition (hypothetically speaking). Then evangelism has an input component (divine revelation) and an output component (understood and appreciated). I believe both sides are important. If we only accept the second part (understood and appreciated) one can be left with an unhealthy pragmatism (whatever gets people to respond the way we want) springs up. Why not simply pay people to convert? I know of both Christians and Muslims doing this… if it works, how could it be wrong? Yet it could be wrong… and ultimately ineffective. On the other hand, one can picture the other extreme where presentation of the gospel is success in itself, regardless of the response. Anything that allows one to carry a message to another is justified. Why not hold someone at gunpoint and give them the message of the Gospel? If the message is given, who cares if it creates a positive response or an angry rejection? Don’t get me wrong. I am not attacking this group. I don’t even know them. I was a bit surprised that the preaching was all in English, especially since all of the team members appeared to be Filipino. But I don’t know if they were a local group or a group that came on a short-term mission. They appeared to be (at least loosely speaking) Protestant. I don’t know if it is a heterodox group, orthodox group, or semi-orthodox group (all three groups are pretty common in the Philippines). I do know that the group was loud, abrasive, and appeared kind of angry. The God they described sounded pretty unpleasant. (I do know that God has given us a choice between life and death, yet some evangelism methods seem to spend more time on God’s wrath than on His love and mercy.) Were they doing God’s work? I am sure they felt like they were? I don’t know. Were they effectively evangelizing– adorning the Gospel of Christ (as described in the book of Titus) or were they making the Gospel (and God) look ugly. Again I don’t know. I really really really don’t know. Our group, Bukal Life Care (www.bukallife.org), focuses on psychoemotional care, and other types of ministry that could be described more as social ministry. Some would argue that we are failing to obey God since our normal methodology rarely includes a direct presentation of the gospel. Guilty as charged on that. Yet, because of our helping ministry, it is surprising how often people ask what group we are with, and what we believe. They actually appreciate that we work with a number of Christian groups (not just one) and that we focus on helping people understand God’s love. Very often we end up sharing the Gospel because we are asked to. Is that better than trying to shove the Gospel down the throats of others? I think so. Those that argue otherwise like to quote verses talking about the power of God’s Word (sharper than any two-edged sword and not returning void). However, power without control can be more destructive than constructive. The power to harm and heal is in the instrument used… but being able to guide such power to heal instead of harm takes wisdom and skill. A method that is common and respected in the Philippines is Rapid Rural Assessment (or appraisal). It is used primarily for community development. It does not actually have to be “rural,” that is just its traditional setting. Additionally, it can be modified to where the researcher is not merely an outside. Rather the “researcher” is a partnership of outsiders and insiders. In this case it can be called a PRA, where the “P” stands for “participatory.” The presentation is definitely focused on the Philippines where the barangay structure is especially conducive to the methodology. However, any place where there is a strong sense of community, RRAs or PRAs can be done. RRA can be done where there is a weak sense of community, but it is more challenging. Another method is ABCD (Asset-Based Community Development) but I will leave that for another time, or for someone else. In Missions Research, one can divide research into three broad categories: Literary Research, Quantitative Research, and Qualitative Research. Yes, these could be argued about and they do overlap, but let’s go with it for now. Qualitative Research involves development of new sources and data (unlike literary research) and deals with statements and concepts rather than numbers (unlike quantitative research). There are different types of qualitative research. Arguably, the “Big 5” are Biography, Phenomenology, Case Study, Ethnography, and Grounded Theory. In my mind, the most valuable research in Missions are Ethnography and Grounded Theory (although popular, I see Case Study as being more useful for teaching than for actual research. Ethnographic Research involves the description and analysis (qualitatively) of a culture, sub-culture, or micro-culture. The above describes in simple terms how to do ethnographic research, particularly within the Philippine context (although not limited to the Philippines). I have often said that if I had not been raised in a Christian family and raised in a Christian church I would never have become a Christian. Now don’t get me wrong, I would not have become a Buddhist, Hindu, Jew, Muslim, Mormon, or anything else either. I doubt I would become a hard-shelled atheist either, for to be one would entail a religious faith that I doubt I would be willing to commit myself to. I would probably have been an open agnostic. I would doubt whether God exists, doubt whether others really knew for sure, but would hope one day to know for sure. Because I was raised by godly Christian parents in a church that sought to follow Christ (however inadequately), I could see the good as well as the bad. Behind the layers of church-ishness (focus on attendance and money, decisions that center on member care, seeming interest in church growth simply for the sake of church growth) one could still see the outline of Christ… one who could be a model and guide worth seeking after. 1. Focus on NGOs. (sodality structures, ministry groups). Since churches generally welcome everyone and have a broad ministry range, they tend to have ministry that is somewhat mediocre and people of mixed motives and drive. Groups that are more limited in who are members and are more focused in ministry avoid this problem. 2. Create “un-churches”. This term simply describes all of the different ways people try to form groups that don’t look like churches. Some may be small groups. Some may be stylistically different from traditional churches. Some may see themselves as a “different kind of church” while others may not describe themselves as churches at all. 3. Revamped churches. The church stays essentially the same, but makes it look and feel more faddish or friendly to outsiders. All of these have their place I suppose, but to me it kind of misses the point. The church is commonly not seen as a safe place to question and grow. Discipleship programs tend to focus more on quantity or exhuberance of traditional piety rather than on qualities of Christlikeness and love. Churches seek to pull people out of the community rather than inject them into the community. Leadership in the church is narrowly focused, usually, based on formal education and certification rather than Christlike qualities and humanity. It seems to me that it is the character of the Christian that needs to change more than the style of the church. If the character of the Christian allowed people to see the outline of Christ (regardless of how faint that outline might be), the style and structure of the church would not need to be artificially changed. In fact, much of the changes would happen naturally, while other ones would not need to change since they would no longer hinder others from seeing the outline of Christ. Perhaps I am being naive. But let me tell you this. Our Disaster Response Team is on route to Cagayan de Oro to provide chaplaincy crisis intervention for families of those who died and those who have been relocated due to flooding. They have given up time between Christmas and New Years to do this. Their flight was diverted to Davao due to bad weather. Now they waiting in a van to take the 10 hour drive during the night to Cagayan de Oro, risking foul weather and landslides to do this. This is Christlike behavior. Even though our group is an NGO, it could have been a church or any other type of group. The outline of Christ behind the Christian should not be hard to see regardless.